Successfully Added Mini Multimedia Projector with Remote to your Shopping Cart. You can easily connect this mini projector to your computer via the USB cable and use it as a computer screen, or link it to your home entertainment system and watch a DVD with your friends at home. The internal multimedia system is capable of playing today's most popular video and photo formats, include DAT, AVI, MP4, MP3, WMA, JPG, BMP, etc. You can even connect it to PS3, Xbox, Wii or your favorite gaming system for some extreme gaming. If you ever needed to make an outstanding business presentation with quick setup, then this high performing, simple plug and play mini projector is exactly what you need. The special slim design of the mini projector enables it to fit nicely into your suitcase or laptop bag. Along with the handy mini tripod stand and simple plug and play feature, you can easily set it up in front of 100 people crowd while looking really professional and organised. There are endless possibilities that you can use this Mini Multimedia Projector. With the 1 GB internal memory, SD card slot, AV in and mini USB connection, it is your mobile entertainment system that you can take anywhere. 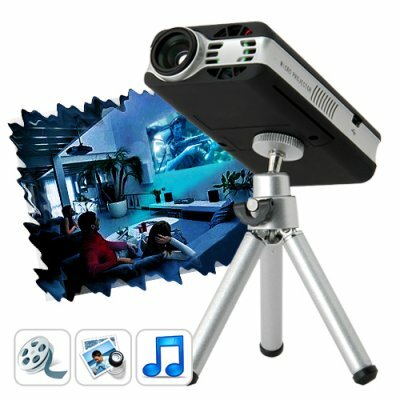 How about take the Mini Multimedia Projector and some drinks to your mate's place for a fun night of movie marathon! This Mini Multimedia Projector is a must have for your business and entertainment. In stock right now, and at Chinavasion's famous electronic wholesale price with 12 month satisfaction guarantee and award-winning after-sale services. Don't delay, click "Add To Cart" right now and we will express ship it to you tomorrow - guaranteed. CHINAVASION DOES NOT PROVIDE TECHNICAL SUPPORT FOR THE UVTOOL SOFTWARE. CHINAVASION HAS NOT FULLY TESTED THE UVTOOLS SYSTEM AND CANNOT GUARANTEE COMPATABILITY OR STABILITY WITH ALL COMPUTER CONFIGURATIONS. USE AT YOUR OWN RISK. How do I transfer files to the mini projector? The UVTools USB Video software is a third party USB to video system that allows computer screen images to be displayed by our E89 Mini Projector through the USB Display function and allows the projector to act as a secondary monitor.